1. 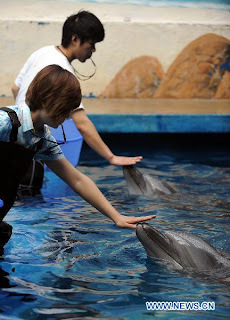 Swimming with Dolphins is an effective treatment for children with autism disorders. 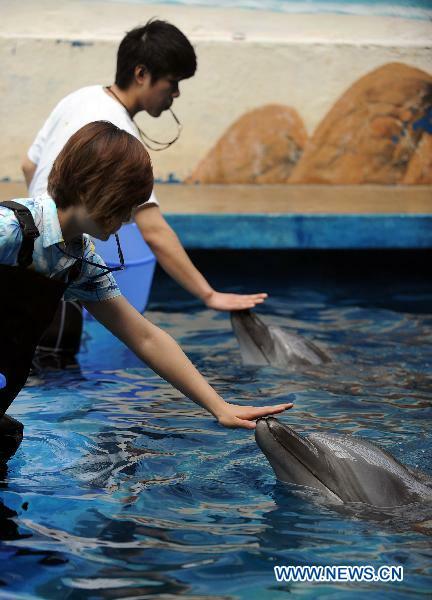 The article NE China uses dolphin to treat autistic children reminded me of this nonsense that has been around for many years that swimming with Dophins has therapeutic value for children with autism. My 14 year old autistic son Conor was diagnosed 12 years ago. The swimming with dolphins myth was around back then and, as the People's Daily article shows, is still swimming around today. 2. Autism isn't really increasing. No matter how far away we move from the DSM-IV changes in 1994 we still see many like Dr. James Coplan rely on the DSM-IV autism definition changes to deny that the incredible increases in autism since then including recent drastic upward estimates from the CDC of an increase from 1 in 150 to 1 in 110 is due entirely to the now long ago DSM changes of 1994. And of course the DSM5 will soon be arriving to further obscure the issue and give the Coplans of the world another straw to cling to. 3.Autism Is 100% genetic As Teresa Binstock said so succinctly over a decade ago in describing the public health authorities' insistence that autism research be directed toward genetic based research it's gotta be genetic. Decades of genetic focused autism research have resulted in a recent massive study report which tells us that .... there is no single genetic autism factor and that therefore ... autism is genetic. YUP let's keep studying the genetic laundry of autistic children and ignoring environmental toxins including those injected into pregnant women and young children as possible causes of autism disorders. And if ignoring environmental factors, including possible vaccine factors doesn't work lets attack and demean celebrity autism parents for daring to question the safety of vaccine cocktails and environmental contaminants. 4. Ari Knows Best. Parents evidence and decisions about their children's autism is anecdotal, selfish, emotional, hysterical and untrustworthy. So let's talk to the latest publicity seeking high functioning person who might be autistic to learn how the autistic mind works. From Jim Sinclair to Ari Ne'eman and all points in between parents shouldn't decide whether their child is high or low functioning, shouldn't talk about their child's autism disorder like it's a ... disorder ... or a medical diagnosis or even use terms like functioning. Parents should not seek to treat and cure their own children. After all, Ari Ne'eman, a very high functioning, very well connected recent University graduate knows better than Harold Doherty and other parents of autistic children severely affected by autism what is good for our children. Right? Ari says my son doesn't want to be cured? I guess this person with nothing in common with my son, who doesn't know him and has no responsibility for his care should decide right? Apparently the Obama administration thinks so appointing Mr. Ne'eman, who denies autism is a medical or real disability, and should not be cured, to prominent national US disability and autism committees. From swimming with Dolphins to swimming with Jim, Temple, Michelle, Amanda and Ari some autism myths will never die. You know, Harold...not so sure about dolphins and all...but there's a lot more science behind the therapeutic value of animals for kids with all sorts of challenges than there is for your #4 on the list! Obama administration thinks so appointing Mr. Ne'eman, who denies autism is a medical or real disability, and should not be cured, to prominent national US disability and autism committees. That makes me regret my vote. urrrgh, make so angry. Khaled wants to be cured. He wants to do things the way he knows other people are doing it, he is frustrated with himself when he cannot focus and his body wont stop moving....he is trapped. We see it in everything he does. And he is only 4! What a load of rubbish about individuals not wanting to be cured. I don't want my child's disorder to be sidelined as just "a difference", he is smart, funny, loving, gentle and severely disabled by AUTISM. The real autism. Not the "trendy label" shoved down our throats by the media, but the real thing.